The MAX1909/MAX8725 highly integrated control ICs simplify construction of accurate and efficient multichemistry battery chargers. 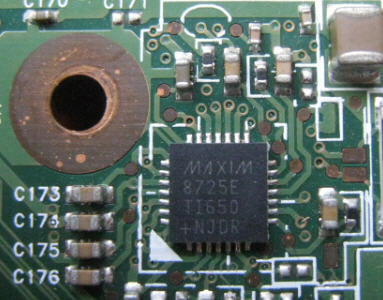 The MAX1909/MAX8725 use analog inputs to control charge current and voltage, and can be programmed by a host microcontroller (?C) or hardwired. High efficiency is achieved through use of buck topology with synchronous rectification. The maximum current drawn from the AC adapter is programmable to avoid overloading the AC adapter when supplying the load and the battery charger simultaneously. The MAX1909/MAX8725 provide a digital output that indicates the presence of an AC adapter, and an analog output that monitors the current drawn from the AC adapter. Based on the presence or absence of the AC adapter, the MAX1909/MAX8725 automatically select the appropriate source for supplying power to the system by controlling two external p-channel MOSFETs. Under system control, the MAX1909/MAX8725 allow the battery to undergo a relearning or conditioning cycle in which the battery is completely discharged through the system load and then recharged. The MAX1909 includes a conditioning charge feature while the MAX8725 does not. 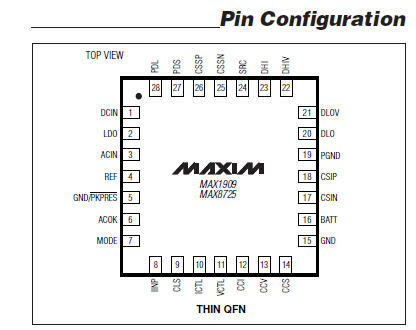 The MAX1909/MAX8725 are available in space-saving 28-pin, 5mm  5mm thin QFN packages and operate over the extended -40°C to +85°C temperature range. The MAX1909/MAX8725 are now available in lead-free packages.